Also available is watchOS 3.2 in this release, while tvOS 10.2 is rolling out as well. 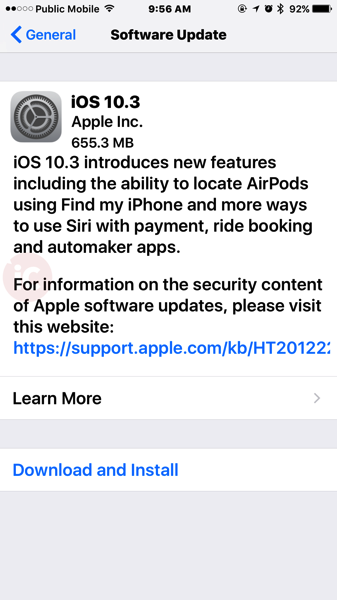 iOS 10.3 comes with Find my AirPods, while watchOS 3.2 gets a new Theater Mode. We’re installing this final update now. Siri also knows cricket sports scores and statistics for the Indian Premier League and International Cricket Council. With SiriKit updates, Siri can now support paying and checking the status of bills with supported payment apps, plus also scheduling with ride booking apps. CarPlay gets new shortcuts in the status bar for quick access to your previously used apps, while Apple Music gets a new ‘Now Playing’ screen. For those renting movies, you can now rent once and watch across all your iCloud devices. For Maps, you can get hourly weather by using 3D Touch on the current temperature. Calendar can now delete an unwanted invite and report it as junk. As for the Home app, you can now trigger scenes using accessories with switches and buttons, which also works for accessory battery level status as well.